Dying to free rip and convert DVD to MP4 for playback on iPhone iPad Android devices? Desire to garner the best free DVD to MP4 ripper? If the answer is "Yes", congratulations, you're in the right place where you can find the top three best free DVD to MP4 converters. Now, let's check specific details of the best three free DVD to MP4 rippers for Mac on aspects of ripping function, speed, decryption, video quality etc. And single out the most suitable free DVD ripper for Mac Yosemite/El Capitan/macOS Sierra for you to convert DVD movies to MP4. 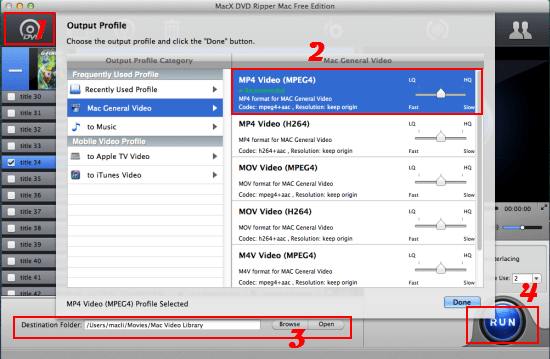 MacX DVD Ripper Free is the one in a million in the current free DVD ripper for Mac, for it can support Mac users to freely backup and rip DVD to Mac in MP4, but also convert DVD to MOV, M4V, Apple TV, iTunes, MP3, ACC and more such that playing back DVD on iPhone (new models), iPad mini 4/Pro, iPod, iMovie, Galaxy S9/Note 9, HTC 10, Surface Pro 4 just like takes candy from a baby. What matters most is that this all-in-one yet free DVD to MP4 converter for macOS is capable to circumvent almost all the DVD copy protections including Sony ARccOS, Disney X-project and then hassle-free rip protected DVD to MP4 on Mac. Hence, watching encrypted new DVD movies on your portable devices is not building castles in the air. And you will be also surprised to see the amazing lossless high quality after a few mins DVD conversion, which attributes to its inherent Intel/Nvidia/AMD GPU hardware acceleration, multi-core CPU utility and High Quality Engine. Handbrake, an open source DVD to MP4 converter for Mac, is the widely recognized best free DVD converter for Mac users to free rip DVD to MP4 and MKV, with the ready-made profiles for iPhone, iPods, PSPs, Apple TVs, PS3s. And with its easy-to-savvy interface, no matter you are a beginner or an expert, you can make Handbrake rip DVD to MP4 just in several simple steps. There is a kindly reminder that for those who accumulate certain encrypted DVDs and plan to rip them to MP4 using Handbrake, you have to seek for the help from the third party-VLC media player to partner with it, or you will encounter Waterloo but nothing. Still, in case you update your operating system to Mac OS X 10.11, then Handbrake will let you down as it isn't upgraded to support ripping DVD to MP4 on Mac El Capitan yet. In such case, shifting your attention to Handbrake alternative is the advisable choice. iMacsoft Free DVD Ripper, as one of the best DVD ripper for Mac allows users to free rip DVD to MP4 on Mac OS X 10.5-10.9, but also let you rip DVD to MPEG-2, 3GP, VOB, PSP, PS3 with preset profiles offered. But the ointment is that this free DVD to MP4 ripper for Mac is paralyzed to rip the encrypted DVDs, let alone the Disney copy-protected ones. And it also disappoints you when it comes to rip DVD to MP4 free on Mac with failure to keep high quality and fast speed. Verdict: The above mentioned top three best free DVD to MP4 converters for Mac surely solve the problem - how to rip a DVD on Mac, but also have their own virtues and drawbacks. Just as the saying goes "different strokes for different folks", which one on earth being the best free DVD to MP4 ripper depends on your specific needs. Assuming you are chasing for a free DVD movie converter to barely rip ordinary DVD to MP4 for playback on handheld devices, Handbrake is seemingly wonderful. And beyond ripping DVD to MP4 free on Mac, you still hunger for free ripping unprotected DVD to MPEG-2, 3GP and VOB for playback, iMacsoft Free DVD Ripper cuts the buck on this point. Well, if you wanna pursue a versatile yet solid free DVD to MP4 ripper for Mac Yosemite to rip Disney DVD to numerous video formats, no doubt MacX DVD Ripper Mac Free Edition is the best one for you. Wonder how to breezily rip DVD with MacX DVD Ripper Free Edition? The tutorial below will show you how easy it is to free rip DVD to MP4, MOV, M4V, etc on Mac (Yosemite/El Capitan/macOS Sierra) with this Free DVD to MP4 converter. Step 1. Download MacX DVD Ripper Mac Free Edition and run it, click "DVD Disc" or "DVD Path" button to import the DVD files. Step 2. Choose "to MP4" from Mac General Video as Output formats. And you can also choose to free rip DVD to MOV, DVD to M4V, DVD to iTunes, DVD to Apple TV, etc. And there is a series of parameter settings are available for you to touch up your DVD videos, such as frame rate, video resolution, video bit rate, audio volume. Step 3. Click "Browse" button in output setting area and select a destination folder to save your converted MP4 video. Step 4. Click "RUN" to start the DVD to MP4 conversion. You can view the conversion progress and are able to cancel the converting process at anytime. For those who would like to rip DVD to more output formats such as DVD to AVI, WMV, FLV, MKV with advanced functions, its advanced version MacX DVD Ripper Pro is just what the doctor ordered. Better still, it also features the functions of making 1:1 lossless DVD to ISO image with original audio and video quality and copying DVD to MKV within merely mins. Note: Please rip or copy DVD under the concept of Fair Use and does not encourage any illegal reproduction or distribution of copyrighted content. Please abide by the local DVD copyright law before doing it. After you have converted DVD to MP4 on Mac, you can take one more step to watch DVD movies on iPhone iPad devices. MacX MediaTrans help you to you to do so by transferring videos from Mac to iPhone iPad without any hassle. Besides, you can not only move the converted MP4 DVD movies, but also other format videos like MKV, AVI, FLV, M2TS etc. to iPhone Xs/Max/XR/X/8/7/6s/6/Plus, iPad Pro/mini 4, Galaxy S9 edge+, HTC, Huawei thanks to the built-in auto video converting function.